It is an investment support scheme for landholding farming community, being implemented by the State of Telangana. Every landholding farmer is given a direct benefit of Rs.4,000/acre/crop-season as investment support irrespective of the extent of landholding. Taking a cue from Telangana, Jharkhand and West Bengal governments have already announced similar schemes with a benefit of Rs.5,000 per acre once a year. RythuBima Scheme – It is to provide financial relief and social security to the family members/ dependents, in case of loss of farmer‘s life due to any reason. Farmers in the age group of 18 to 59 years are eligible for enroll under the scheme. 5 lakh claim in the event of the farmer‘s death, irrespective of the cause. The entire premium is paid by the government to the Life Insurance Corporation of India. It is also being implemented by the government of Telangana. Economists are favouring these direct benefit schemes like these over farm loan waivers and price difference schemes. It is also a scheme devised by the Government of Telangana to ensure safe and sustainable piped drinking water supply from surface water sources. It is aimed at providing tap connection to every household, the surface water sources being Krishna and Godavari Basin. Water will also be provided to Industrial requirements. There is also a plan to install optical fibre pipelines using the extensive water pipeline network being laid under the mission in an aim to save large amount of funds in installing OFC networks. It is a price deficiency payment (PDP) scheme being implemented by the state of Madhya Pradesh. BBY assures that farmers at least get the MSP value for their crops. Subsequently, the farmer is allocated a time slot to bring his produce to the mandi, where the quantity eligible for deficiency pricing is determined. The quantity is determined based on the average productivity of the particular district and the cropped area of the particular farmer. The farmers receive the difference between ―average sale price‖ (market price) and ―minimum support price‖ (MSP), directly into their bank accounts. It hence provides an alternative to physical procurement of commodities at MSP, which comes with the hassles of storage, transport and marketing. Problems – Only those farmers registered on its portal gets benefited. Financial burden will be more than 90% of the state‘s total agri-budget, rendering BBY unfeasible. It is a solar power scheme for farmers recently launched by the government of Gujarat. It enables farmers to generate electricity for their captive consumption as well as sell the surplus power to the grid and earn an extra income. This is the first such scheme in the country. The State and Central governments will give 60% subsidy on the cost of project. 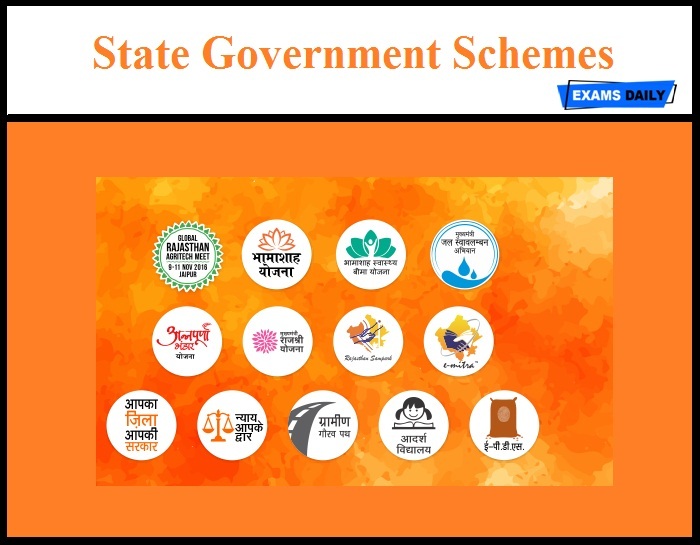 The scheme is being implemented in the State of Karnataka to curb corruption in public service delivery in key departments. More than 725 services are being provided under this mission. Now, the state government has proposed to launch the version 2 of SAKALA scheme with the existing SAKALA-1 fails to curb corruption. SAKALA -2 will address shortcomings in the existing Act by including a provision for imposing penalty of Rs. 250 per day for delay in addressing complaints. The proposed Bill includes mandatory display of citizens‘ charters and job charts in all government departments, social audits, public hearings and district & state level grievance redress processes. It is a scheme developed by U.P state government to popularise products produced by MSME sector. Under the scheme, the government has set a goal of providing employment to 25 lakh people in 5 years through the financial assistance of Rs. 25,000 crores. It aims to improve the skills of local MSME artisans and increasing the reach of their products. It is a scheme introduced by the Government of West Bengal. The scheme aims to improve the status of adolescent girls from disadvantaged families through small conditional cash transfers. Through the initiative, cash will be deposited into the bank account of girls for every year they remained in school and were unmarried, until the age of 18.